Order in the next 2 hours 27 minutes to ship today! This LCN 4011H-AL institutional adjustable door closer with hold-open arm is adjustable from size 1 to 5 and it is shipped set to size 3. This closer mounts on the hinge side of a door which is the pull side. - Interior doors: 24" to 4'6"
- Exterior Doors: 24" to 3'6"
A hold-open arm used on any closer allows that closer to remain in the open position until it is manually closed. This feature however, may not be used on fire rated applications since they need to be able to close on their own in case of an emergency. 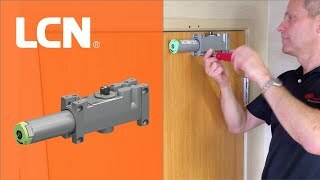 This LCN 4011H-AL mounts on the hinge side of the door which is the side the door is pulled from.